In 1956, a young author logged his own experiences in the same war-torn Algerian context and French tongue as in the case of Camus, but from a very different vantage point: At the age of 26, Kateb Yacine–23 years junior to Camus, wrote Nedjma, a book about unrequited love set in the context of violent revolution. The novel, a classic work of Algerian literature, tracks the love of four young men for an enigmatic and charismatic woman who is the daughter of a French woman and an Algerian man. Unlike in Camus’ work, in Yacine’s fiction there is no moral indifference. Right and wrong are clearly marked out: with wrong marked by acts of irrational violence, and right described through courage and loyalty. The colonial administration is the clear enemy, the obvious source of injustice. Moral decay in the form of violence, sexual depravity and abandonment are constructed as consequences of and responses to colonial injustices. In Nedjma, we are placed in the midst of the devastation of broken communities, dismembered traditions, muddied pasts, overwhelming presents and uncertain futures. What emerges from this cacophony is not merely an image of a bleeding land, but a deep and penetrating psychological description of the frailty and adaptability of the human psyche in the face of violence and destruction. Through his narrative, Yacine seems to suggest that, at its root, the colonial experience was a cause of deep psychological trauma. The book begins in violence and flight: Lakdhar, one of the four central characters, has escaped from jail after being arrested for punching the foreman of the construction site where he was employed as a laborer. From this point of origin, the acrobatic temporality of the narrative takes us back and forth between violence, sexual perversity, revolutionary zeal, confusion, betrayal and lethargy. Gradually, the story unravels, like the strenuous and painstaking unraveling of a tight and layered knot. The novel weaves back and forth in time and from one character to the next to reveal the deeper conditions of the events in the very first scene and then suddenly, when enough facts are laid bare, the cacophony is turned diaphanous. It is the impossible strain of recovery that is the ultimate subject of Yacine’s novel and its narrative, its chronology, its rhythm, its character development and its carefully coded use of language all trace a delicate boundary around the colonial crime scene in Algeria. The four central characters: Rachid, Lakdhar, Mourad and Mustapha we initially assume are manual laborers. We hear casual reference to prison, alcohol and sale of a weapon for alcohol in the very first page of the novel. We find Lakdhar takes a casual attitude to having just escaped from prison, “Shut up. Don’t Nag,” he instructs Mourad. The men enter “into the rattiest Arab cafes of all,” and are “greeted with gestures of recognition.” (15) Immediately, the reader is given a rather direct, but false sense of location. We are ‘evidently’ in the underbelly of society, in a ‘ratty’ café with a ‘ratty’ bunch. Yacine and Camus form two pieces of the same literary puzzle that shines light on the brutality of colonial Algeria. 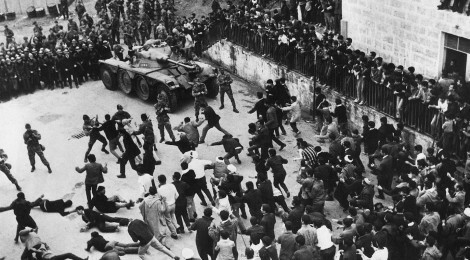 On the one hand, figures like Yacine evidence the devastation and violence of colonial oppression experienced for Arabs and other native Algerians, as well as the romance and adrenaline associated with a revolutionary uprising. On the other hand, the writings of Camus and other Pied-Noirs intellectuals (including Louis Althusser and Jacques Derrida) reveal the traces of an alienation and torment that can only belong to someone complicit in oppression, even if only through silence. The two authors sketch from the same devastated and bloody landscape of a childhood in Algeria, where law and order have given way to Marshall Rule. However the possibilities they imagine and project onto the present and the future of the same landscape are very different. In Yacine’s novel, we are not with Sisyphus in the cursed and futile after life. We are with David, trying our wits against some might Goliath. There is a strong sense of aspiration–aspiration for love, freedom, stability, honesty, money. While there is a strong sense of alienation, the alienation is something that must be overcome. There is a gradual but steady climb from hell towards the heavens. Yacine’s is the novel of a society that is planning its future in a devastated present on the foundations of faith alone. It is a portrait of a society that persist despite loss, despite constant and deliberate reversal at the hands of colonial oppressors. Death becomes an object of fetish for Camus, as well. He writes, “There is but one truly serious philosophical problem: that is suicide.” (Camus,18) Camus argues that first and foremost we must decide whether life is worth living at all given its innate incoherence and contradictions. He writes: “In the face of these contradictions and obscurities; is it the case that there is no rapport between the opinion that one can have about life and the gesture that we make to leave it?” (20) Camus posits the question of suicide as though it were an obvious one. Still, the urge is not common enough to warrant his conclusion, and the required gestures necessary to end one’s own life even less so. Camus argues that the gesture itself is challenging because we learn to live before we learn to think. Habit prevents us from acting. Lakshmi Gopal is an aspiring philosopher. Lakshmi's interests lie at the cross-section of philosophy, culture and society. She is a graduate from Columbia University, New York and King's College, London. In her current academic research, she is focusing on the egalitarian discourse emerging from India. Lakshmi also takes an active interest in writing and photography.